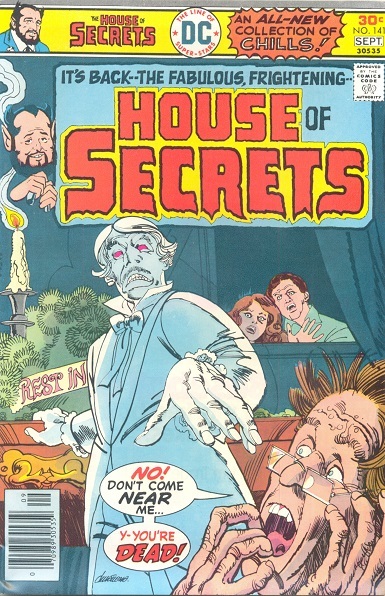 House of Secrets #141 (August/September 1976). So here’s a back issue of particular interest to me, Mike, the guy what runs Sterling Silver Comics who also happens to be a huge fan of the comic book character Swamp Thing. Issue #140, the issue just previous to the one pictured above, featured what was supposed to be the first part of an ongoing serial starring the Patchwork Man, a misunderstood Frankenstein’s Monster-ish menace spinning out of the early issues of the original Swamp Thing series. I bought my own copy of that issue, a few decades back, but was never able to track down a copy of #141…I was never even able to confirm that there was a Patchwork Man story in #141, as the price guide didn’t mention it, and there was no World Wide Web at the time were I could further research the matter. In the intervening years I did discover that the Patchwork Man only had his one installment that was published in the United States, and it turns out the second part intended for the following issue only saw print in a foreign release (that, alas, I have not yet acquired). Anyway, back to the issue above…there was a four-month publishing gap between issues #140 and #141, during which apparently some editorial decisions were made and it was decided not to continue on with ol’ Patchie’s adventures. What we got instead were a couple of stand-alone horror stories, including one written by Batman’s co-creator Bill Finger…who actually had died a couple of years prior to this comic’s release, so this story had been sitting around a while. This is the first copy of this comic I’d ever encountered, after all these years of being curious about it even after learning about its unfortunate lack of Swamp Thing-related content. I’m glad I finally got to see it in person! This entry was posted in Back Issue of the Week on December 9, 2016 by Mike.